Locations: Ann Arbor, Horseshoe Curve, Detroit, Dearborn, Wayne Jct. and more.. This is the final installment of the great Penn Central series from Green Frog. Emery Gulash and his 16mm color film were there to record the action. 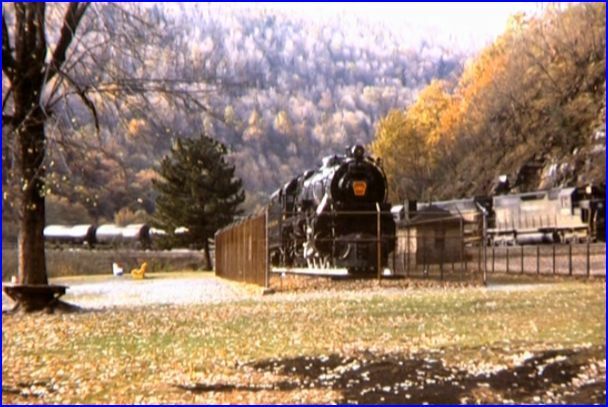 Major changes were occurring and the Penn Central was soon to disappear into big blue. We are now entering the Conrail era. Special Note: Green Frog has to be congratulated on providing such a fine series, with the six volumes of Penn Central. They are all enjoyable and each volume is a little different, just as there were changes for the railroad each year. Railfans are fortunate that Emery and The Frog have assembled this collection. Thank you! A blue Conrail GP40 leads off the show in Michigan. Amtrak F40PH in charge of this 1976 train. Odd looking new turboliners contrast, with a raunchy looking Penn Central E8. For practical purposes, a casual onlooker would still be seeing Penn Central trains. 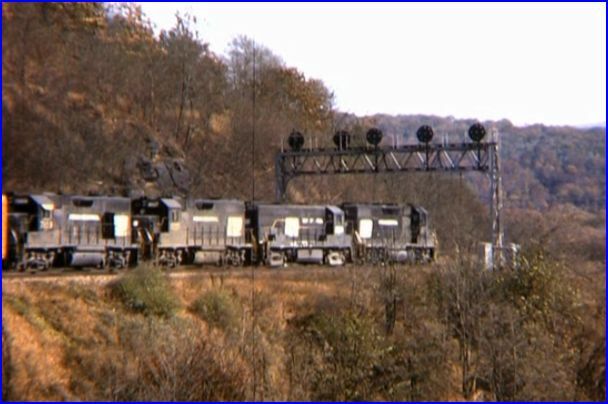 Early Conrail parades at Horseshoe Curve. Some locomotives have been hastily relettered, with CR stencils. It looks a little funny now, to see those shiny blue Conrail cabooses vs. the grimy, rusty ones, that were commonplace years later. The fresh blue paint on the Conrail locomotives, really illustrates some new hope. Notice the many worn-out looking Penn Central units. There are solid sets in full Penn Central colors too. The sound trend of a working film projector, has mostly replaced the synced up train sounds. Likely, a cost and time concession. Would have preferred, more frequency of additional sound. The gaps without the live sound get long. It’s a predominately Electromotive (EMD) diesel-powered world. GP40, GP38, GP9, F7, E8. A few Alco products do appear. French Turboliners. There are some good views of the freight cars shown. The film itself looks fabulous. Colors look accurate and this is very high quality trainwatching. This is very noticeable, on the bird’s-eye view, from an overlook on the mainlines. Compare that view and detail, with some earlier releases. The transitional nature of the railroad, makes for some intriguing railfanning. Old and new are run together, in a colorful array of passing trains. Correct for the time, you never know what will show up, and there is always a caboose! By now, veteran Emery Gulash/ Green Frog fans will recognize many of Emery’s favorite shooting locations. Town Line, Wayne Jct., Ypsilanti, the paper mill, Huron River, Michigan Central headquarters. Newer locations such as the I-75 bridge. We end up in passenger train mode. Amtrak is even less exciting than the previous years of PC and PRR. It’s largely repainted old equipment, from all the other roads donated equipment. That and the futuristic looking turboliner. Again, the film looks great. Trees, blades of tall grass and the trains themselves leap off the screen. Narration is informative and direct, right to the point. The show ends at Wayne Jct.. The yard and a freight house are seen there. Mention is made of this being the last Penn Central video edited by Emery Gulash. The film processing is every bit as good as the company line. Scanned frame by frame in full 1080i high-definition. No film flicker. The sounds are great, when present. Running time is the shortest of the series. The look of the enhanced footage is what carries this program. The very high quality look of this train video… make it a must see film. This entry was posted in ATVR Reviews, Green Frog Prod. 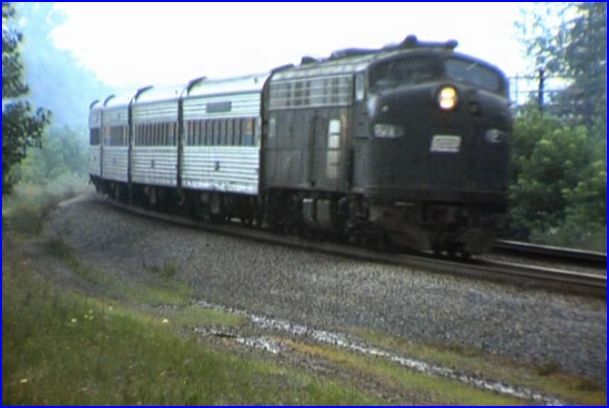 and tagged American Train Video Reviews, Amtrak, Chicago railroad, Conrail, Emery Gulash, Erie Lackawanna, new releases, Railroad, Train DVD by William J. Hudson. Bookmark the permalink.